I overheard the conversation as I was leaving my Mother’s assisted living earlier today. ” Mom, we ARE going to the doctor!” said the son as he maneuvered his mother’s wheel chair through the parking lot. It was all so familiar – the frustration, the confusion from his Mom, the exasperation for them both, and that sigh – how well I recognize that sigh. It’s Memorial Day weekend and it is the designated federal holiday to honor those Americans who have died while in military service. It used to be called “Decoration Day” as the task of the weekend was to decorate graves. In our family, I recall it as a typically cold and rainy weekend, when we gathered all the flowers from our yard and that of the aunts and uncles, neighbors and grandparents, and took the homemade floral arrangements to each of the cemeteries where grandparents, and other family members were buried. It seemed to me all my other friends went on picnics, or to the local pool opening, but nope, not me. In our family we took our “grave decorating” seriously. In fact, that task has now fallen to me. I have shared in this blog some of my adventures changing the flowers seasonally as my Mother has passed on that family duty to me. I share this because also today, I read an article about the south and some of its traditions. The author stated that ” things stand for things” in the south. He meant that seemingly insignificant “things” may have signficant meaning in southern families. In his case, a plate of deviled eggs reminded him of his grandmother and the love and loyalty his family felt for her. And, of course, it is probably not exclusive to the south. In my family, I think, Memorial Day stands for the same thing as his deviled eggs. Memorial Day for my family, was first and foremost, about visiting graves. It’s not that other families don’t care. In fact, many families don’t have a grave to visit. With cremation becoming more commonplace, there may not be an actual grave site. Or, it may be that the family members live far away and cannot visit. But for us, it was a time-honored tradition. And while I clearly recall my childhood dismay at having to drag about the jars of water and the flowers wrapped in newspaper while it seemed all my friends were doing “fun stuff”, I also recall the stories of those departed loved ones that were shared during those visits, I remember my father’s tears one year as we visited his mother’s grave. My father was one tough cookie, and it made am impression on me that this “man’s man” shed tears that day because he missed his mother. Sometimes I wonder what will happen as I age and may become physically unable to make the rounds of all the cemeteries. Or what if we finally really do decide to move further south to escape the nasty winters that are becoming even more nasty each year? Who will do the grave tending? Will my own children, who are members of an even more busy and geographically scattered generation, put flowers on my grave let alone all the other relatives that are on my grave tending rotation? But then I realize, there are many ways to show we care, to share our family loyalty and to tend to our loved ones. Just as that son I saw earlier today was showing is family loyalty and care. While this may seem like a rather rambling blog post, it actually does have a point. 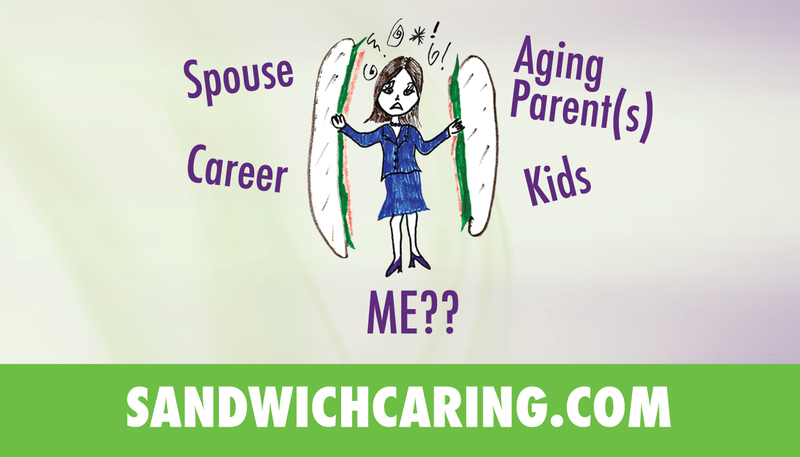 We Sandwich Caregivers stand for things – like the article I read stated. We stand for love and loyalty, for responsibility, for family and tradition. In fact, we also stand for “service” and in many ways we stand for “battle”. We are often warriors – battling the healthcare system, battling our loved ones who may not always make choices that are good for them ( “Mom, you really DO need to take those pills. They HELP you! !”), battling diseases that steal memories and cause pain for those we love. So, the true point is, I want to wish each and every one of you a Happy Memorial Day – as you face battles and meet the challenges that caregivers face daily. This Memorial Day weekend, I hope your memories are good ones, I hope your picnics have no ants. I hope your holiday travels are safe. I hope your cemetery visits involve sunshine and bright blossoms. And I hope you realize that all you do for those for whom you care, stands for something – something good and noble and true. This entry was posted in caregiving, dementia, life challenges, parents, planning for the future, sandwichcaring and tagged aging parents, caregiving, dementia, health care on May 21, 2015 by janestory.